When a star-studded team starts conversations about coming together, you should listen. The buzz about SOCIAL's coming at the start of fall was warranted - names such as Andrew Dorsey, Jeffrey Boullt, and Mike West were associated with the concept. From the beginning, there were many expectations for the restaurant, and we're happy that after our visit, we believe that even those expectations have been surpassed. Duc and I were invited in one early evening to taste what SOCIAL had to offer, and we both left convinced that it is the restaurant the Costa Mesa (heck, Orange County!) 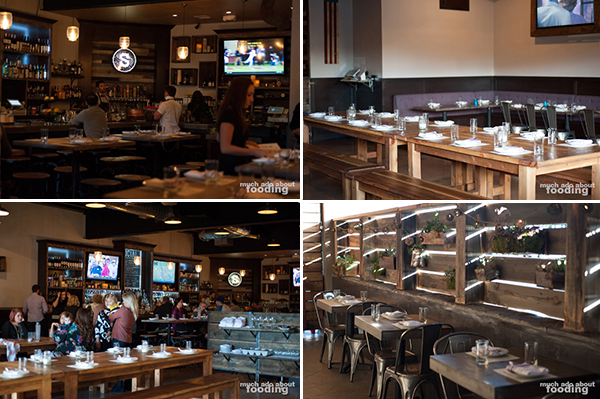 needs not only for its communal atmosphere and excellent buildout but also the impressive food and drink. Like its own name, SOCIAL is made to cater to a social environment. Communal tables are set up in the main dining area with a few booths and high tabletops along the edges. An outside patio is easily accessible from a sidedoor but is also connected to the inside via an open wall/window. I can see this being the perfect area to host a cocktail hour or get-together that still gives guests the ability to see into the restaurant. A slatted wall with greenery closes the patio off from the not-so-attractive street and parking lot outside of SOCIAL; in fact, the restaurant is in a strange location across the street from major retailers. 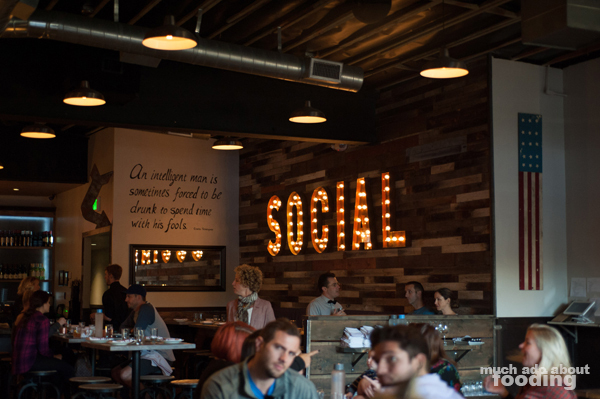 I liked how the "social-ness" was contained within the restaurant space which felt open. We began the evening with cocktails - the Social Sour ($14 - scotch, lemon, hazelnut, and atomized bitters) and Cynarra ($14 - gin, cynar, lemon, ginger, honey, and cucumber), wonderfully balanced drinks that showcased the creativity of the beverage program. The seating is not the only area that is affected by the restaurant's theme of being social - the menu is built out to encourage sharing and conversation. Most of the dishes are under the "Shared" section of the menu with a few "Snacks" to start off with. There is also an ever-changing Specials board inside that lists the plates Chef Boullt decides to put together based on availability of ingredients. He should be accustomed to such flexibility though; Boullt was the former sous chef of the well-known Playground restaurant in Santa Ana. 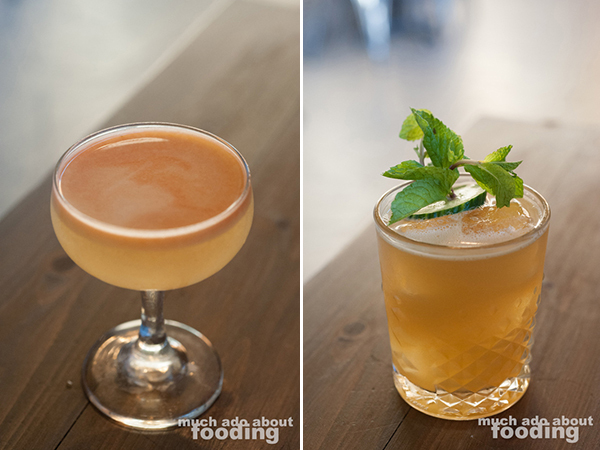 That evening, we tasted items from both the recurring menu and the specials board. 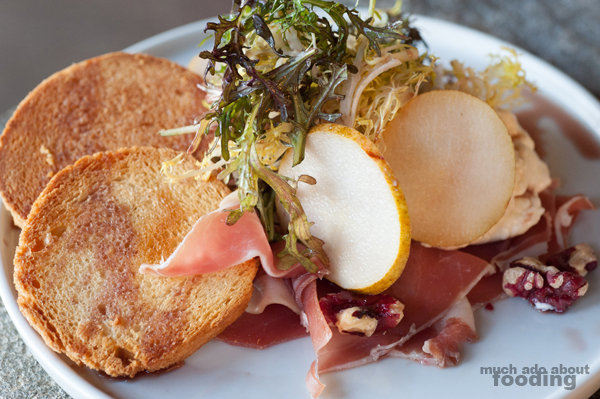 We began with the Pears and Burrata ($14 - speck, red walnuts, chicories, brioche, and banyuls). Talk about a first impression! The combination of all of these unique ingredients led to mouthfuls of all the senses and taste profiles. Creamy burrata accompanied by savory speck, brilliantly-colored red walnuts, bitter chicory, crisply sweet pears, and crunchy sliced brioche makes for quite the experience. Expectations were extremely high for the rest of the food after this shared plate, and they were surpassed once the Lemon Poppy Seed Live Scallop Crudo ($18) came out. 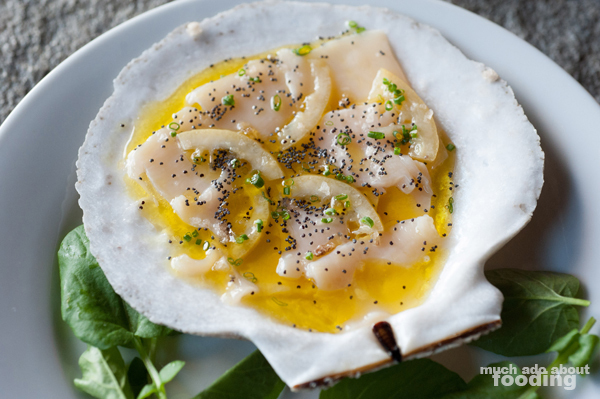 Elegantly served in a large scallop shell, the crudo was extremely fresh and featured citrus notes from the bold peels and generous amount of citrus-infused oil. The shellfish swam in the yellowness, and each soft piece was given a bit of texture from the flecks of poppy seeds scattered about. If I could, I would have had my own plate of this. 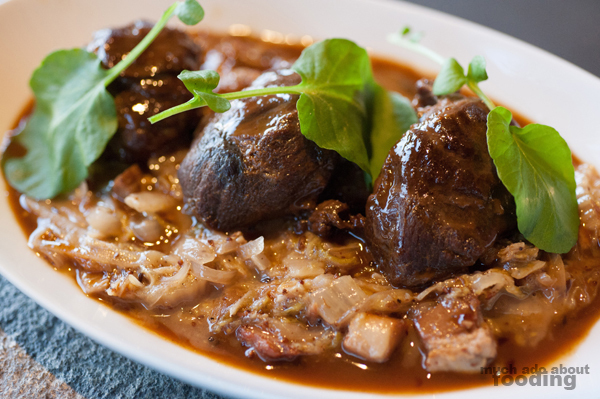 Last in our initial round of plates were the Pork Cheeks ($16 - Berkshire pork, honey mustard choucroute, and watercress), chunks that greatly impressed Duc but could have been less salty to my own palate. The meat was tender and accented well by the choucroute that was a bed above the pork's own au jus. The bright watercress cut through the heaviness of both pork and choucroute components and was later seen to be a recurring part of our meal. (See the watercress in the entrees as well?) The entree section of the menu is called "Seconds" and has just a limited amount of items. Blame the social theme! These higher-ticket items should not be overlooked in any way though. They were easily worth their monetary weight (for the appreciator) and featured ingredients from coveted sources. We partook in their Market Fish ($26 - arctic char, sunchokes, Greek yogurt, cucumber, confit grapes, and green harissa) and the incredibly prepared Akaushi Beef Tenderloin ($44 - chanterelles, cauliflower puree, beef tallow fingerling potatoes, and au jus). 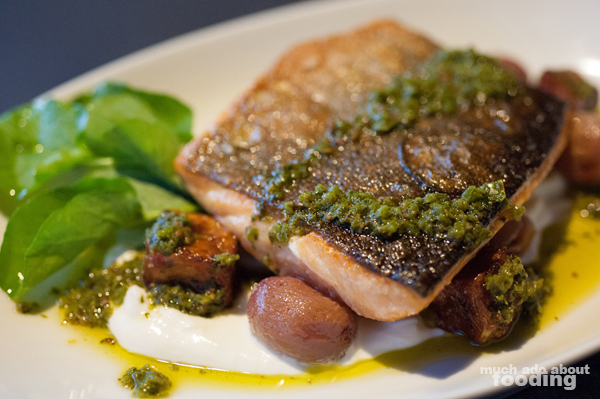 The char's skin was perfectly crisp, a tribute to the chef's own prowess working with the protein. Confit grapes were a different take on providing a sweet touch to a seafood dish but worked remarkably well next to the Greek yogurt tartness and spice of the harissa. The flesh flaked away gorgeously, and the taste of all the pieces made so much sense even if not thought of at first. 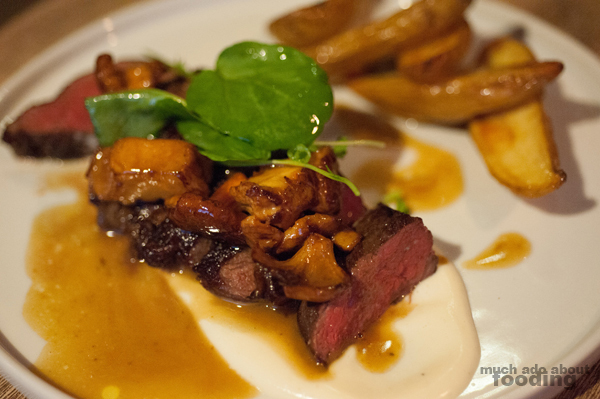 As for the tenderloin, the beef source played a major part into why the dish was a hit. Easily in my top list of best beef dishes, this plate took advantage of the umami of chanterelles alongside their texture. Potatoes fried in beef tallow made for a welcome side that would make for a great stand-alone side dish to order. After all of that, there was still dessert. That section is limited to just two selections; we went with the Jackie's Cinnabun ($8 - hazelnut crumble, smoked cinnamon, and sweet mascarpone) because the chocolate cake option did not seem nearly as appealing. 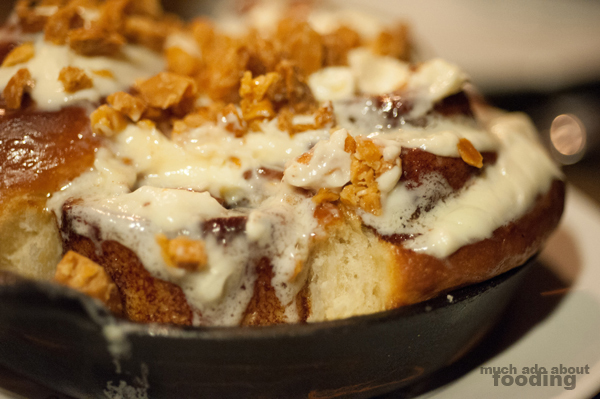 Assuming that a cinnabun would be small and easy to tackle was the wrong mindset because the order came out as a personal skillet of four buns stuck together, coated in a tantalizing sauce of mascarpone. My teeth prepared to be hurt by sugariness but because the "icing" was not true icing but merely sweet cheese, the whole desserts was just the right amount of sweet without being overwhelming. 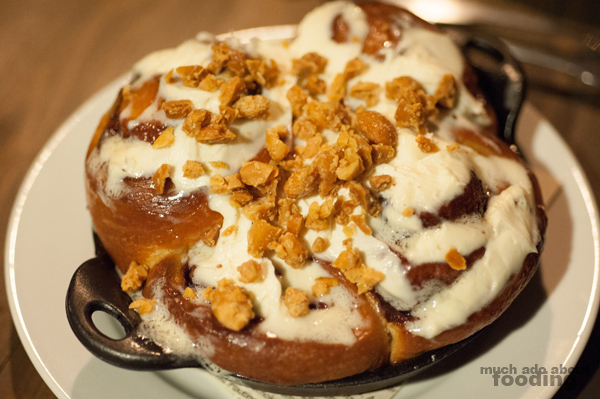 Served hot, the cinnabun is fluffy and substantial with a needed touch of hazelnut crumble to add texture. We both highly recommend trying this one out. Overall, what an excellent experience at SOCIAL not only of the food but the hospitality. Everyone we spotted inside seemed to be having a great time. If you want to get in on that, visit them at 512 W 19th St, Costa Mesa, CA 92627 and be aware that parking is slightly tricky but there is valet.